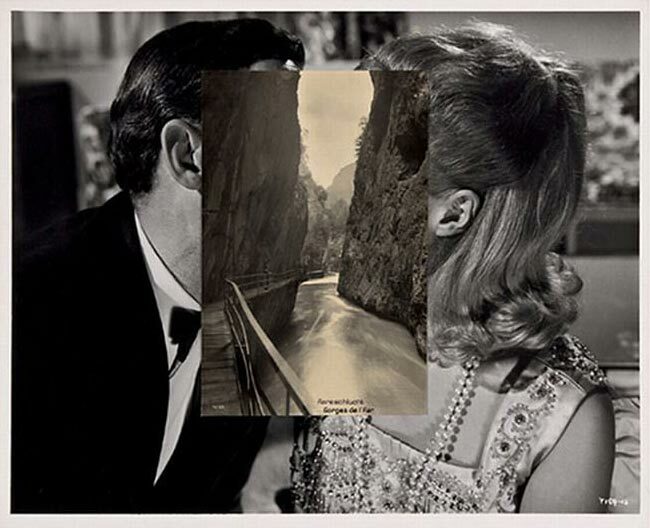 Top: John Stezaker, Pair IV. Collage, 2007. Whitechapel Gallery, London. Bottom: John Baldessari, Man and Woman with Bridge, 1984. Black-and-white photograph on board. I really care about meaning in art. I want things to look simple, but to raise issues, and to have more than one level of comprehension. Our lives are inundated with images, and arranging and re-arranging them is often how we tell stories, convey meaning, or throw wrenches into the works of literal interpretation. Advertising creates image juxtapositions to communicate the messages of commerce: “you want this,” or “buy now.” In either case, the story, no matter how inventive, always has a rational, understandable outcome: a product is being peddled, it’s a great product, and you should buy it. Art, on the other hand, creates an open-ended type of non-linear narrative whose meaning is unique to the viewer / perceiver, rather than dictated by the producer (artist). The most powerful brand names function in the same way that art does: they have great depth and multiple meanings, creating manifold pathways for audience participation, which fosters emotional investment and attachment in the brand. By giving people the power to create their own narratives to explain the “meaning” of a brand name, they become participants in the creation of the brand, the very definition of brand engagement. The works above, by the British conceptual artist John Stezaker and the American conceptual artist John Baldessari, deftly illustrate this concept of creating user engagement. In similar ways, and with a similar economy of means, they each set up a narrative event between a man and a woman, and it is up to the viewer to complete the story. There is no “right” answer. The story isn’t fixed, predetermined, or laden with ulterior motives. And it can evolve and morph over time — just like the best brands.